As you may have guessed, we began wedding planning. First we needed to set a date, hmmm, most of the groomsmen were also military so it would have to be a weekend when they would have a four day. My oldest sister suggested Memorial Day and it was set. Yes, I realize that Memorial day was only a mere 5 months 26 days away from our engagement but it worked. My mom was a God-send. Had it not been for her there probably would have been no decorations in the church and we would have had to use the stinky road side daisy bouquets my father picked for the rehearsal dinner for the ceremony as well. (That story comes later) Mom came through though, the ceremony was in the evening so lots of candles (one of my pre-requisites) and gorgeous bouquets of roses (red and white). The bridesmaids wore black (much to the dismay and dislike of my future MIL) and carried white roses, Mr. Ski wore all black with a red tie, and I of course wore white and carried red roses. Can you tell yet that I'm a simple yet classic type of gal? Mr. Ski was very helpful and dutifully took his groomsmen to get measured and was a big help in the ordering of all their tuxes. I was stressing! But that is no different from any other day. My mom and I did the majority of the planning over the phone. I mean, my wedding was going to be 5 hours away from where I live and I couldn't just drive there every weekend to take care of details. So, I gave her the go-ahead to order invitations and flowers that I had never seen but she had described so well that I felt like they were a good choice. Everything was going smoothly..oddly enough. So it came time for everyone to begin the journey to East Tennessee for the wedding. Mr. Ski's groomsmen came in a Jeep they rented that by the end of the weekend had four flat tires and multiple scratches and dents (thank heavens for insurance), I can only imagine the antics that occurred in that Jeep during the 5 hour trip. The morning of the wedding I was relatively calm and focused on what all I needed to do that day. Unfortunately my maid of honor wasn't much help, but she was going through a hard time then and I have long since forgiven her for her lacking maid of honor skills. I will never forget the moment right before I walked down the aisle, I was holding my dad's arm he was starting to say something sweet and meaningful when I told him to shut up because if he didn't I was going to cry. I didn't cry, until Mr. Ski read me his vows (although I'd heard them before the significance in that moment was overwhelming). 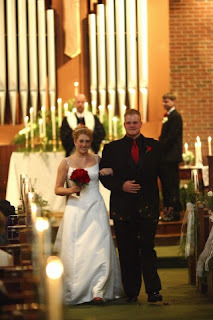 I think I practically ran down the aisle, cheesing the whole way. The wedding went over fairly smoothly, the song my maid of honor sang was beautiful, no one fell or tripped and I didn't pass out (this was a concern) and a short 15 minutes later we were married! It was great, picture time post ceremony got a little hairy, everyone was tired and ready to move on to the reception, therefore, my post ceremony pictures kind of sucked. Mostly because the photographer lacked imagination, I mean he did try to take our ring picture on a hymnal...a bible I get but a hymnal?! Not really liking this suggestion I set down the hymnal and substituted my bouquet of flowers instead. That could be my favorite picture out of the bunch. All in all, the only thing I would ever do over is the pictures. But I'm sure I'll eventually get over that. So, now for the happy ending, which will lead to very random posts about adventures Mr. Ski and I have faced and will face. We did have a happy engagement, happy wedding and now we have our happy beginning. We went to Gatlinburg after the wedding for about a day, the military does not care if you get married and gives you no extra time off for wedding getaways but we did have a great time and continued to go on "honeymoons" for the rest of that summer. I think every weekend trip we took that summer was considered an extension to our honeymoon. We went back to our townhouse, back to our jobs, and back to OUR life. No longer is it my life, my problems, my stories it is our life, our problems, our stories, our laughter, our journey.